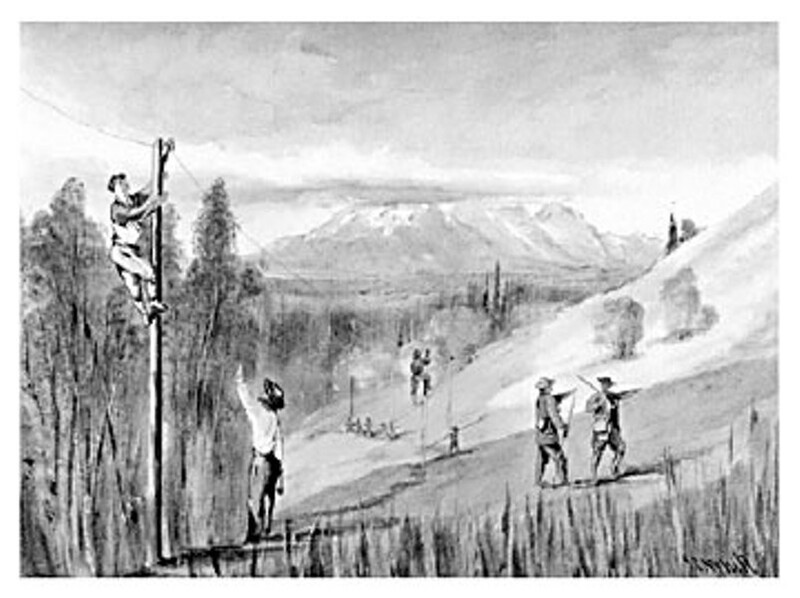 Painting by John Clayton White (1835-1907), construction of the Collins Overland Telegraph. When I consider monumental works of humankind, I think of the Great Pyramid, the Eiffel Tower, the Statue of Liberty, the Saturn 5 rocket, the Panama Canal, Boulder Dam ... and Perry Collins' Overland Telegraph. The last mentioned isn't usually included in those lists of "mankind's greatest achievements" for the good reason that it was never finished. Not because it wouldn't have succeeded, but because it was preempted by another wild scheme. In the mid-1800s, with communication between Europe and America limited by the speed of sailing ships, several entrepreneurs dreamed of a telegraph line linking the Old World with the New. After the failure of several attempts to lay an undersea cable across the Atlantic, Perry McDonough Collins, a well-traveled American businessman with good connections in both Washington and St. Petersburg, conceived of an overland telegraph between San Francisco and Moscow via British Columbia and Russia. His plan was to extend the newly built trans-continental telegraph line into the interior of British Columbia, through Russian America (future Alaska), and undersea across the 52-mile wide Bering Strait to the mouth of the Amoor River. From there it would run 5,000 miles overland across Siberia to Moscow, which was already connected to St. Petersburg and the rest of Europe. After years of negotiations, Collins' crews started construction in 1865. By summer of the following year, the Canadian and Russian sections were well on their way to completion, and given the rapid rate of construction, the telegraph would probably have been operational by 1867. Fate intervened, in the form of another bold entrepreneur, Cyrus Field. Field had failed in his first attempts to lay an undersea cable across the Atlantic in 1857 and again in 1858. Finally he leased the Great Eastern, a ship five times larger than any other afloat at its launching in 1858. On its third attempt, the Great Eastern succeeded in connecting America to Europe by copper cable, and in July, 1866, the first message was transmitted under the Atlantic from Cape Clear, Ireland, to Heart's Content, Newfoundland. Eight months later, with the transatlantic cable still working, work was stopped on the now obsolete overland line. One lasting consequence of Collins' aborted plan was to put Russian America onto the map and into the consciousness of the government of the United States. Without Collins' vision, our flag might have 49 stars and Alaska might still be Russian.